Computers and technology have brought the opportunity for learning directly to our fingertips. Great information both in written form and movie-like formats is only a key stroke away. This space can be updated with quilting-related topics that our fellow guild members have found interesting. If you come across a topic that you think would be of interest to our group, please let us know at email at web manager. MPQG members can access members only areas which include the ABOUT > Member Directory, and > Financials. ABOUT > Pines & Needles Newsletters no longer requires a password. If you would like to change your username or password, or are having any other issues, please contact me. I’ve been asked to do a quick review of the quilt sizes we collect, and where they are sent. NICU - For the NICUs the basic size is 20” X 24”, this fits in the layette. Note that the majority of babies in the NICU unit are boys. If the quilt is a little larger, it is OK. If the top and backing are flannel, there is no need for batting. If there is regular quilting cotton on the top, and it is backed with flannel or has top and backing of cotton, add a light batting. These quilts can be either quilted of tied. If quilted, please use minimal quilting so the blanket will remain supple enough to wrap around a tiny baby. The average size of a baby in the NICUs is only 12“ long, like a doll. NICU NEW SIZE - A new size being donated to the NICUs is a 45” square format. These are used to cover the incubators, shielding the baby from the light. These should have batting, and a dark colored fabric in the top or on the back to help block light. Voices for Children/CASA serves children of all ages, even teen-agers. Sizes vary depending on the age your quilt is appropriate for. Toddler quilts can be a bit smaller, say 36” X 45”. This is also a good size for babies, as we add the Christ Child Society to our roster of recipients. Older CASA children can receive larger sizes. 41” X 60” is a general size for teens. This size is fine for dialysis too, keeping in mind that some adults would need something larger, because they cover up almost completely with their quilts. Veterans - Bed sized quilts are given to the VTC (Veterans Transition Center) because their clients live in refurbished Ft. Ord housing. Their beds are usually twin sized. Every quilt finds a home and is appreciated. These are just general guidelines, enjoy being creative, and think about the person or child who will be receiving your handiwork. THANK YOU. Dear MPQG, I really enjoyed the festivities on Monday evening and was delighted to take home such a beautiful basket! 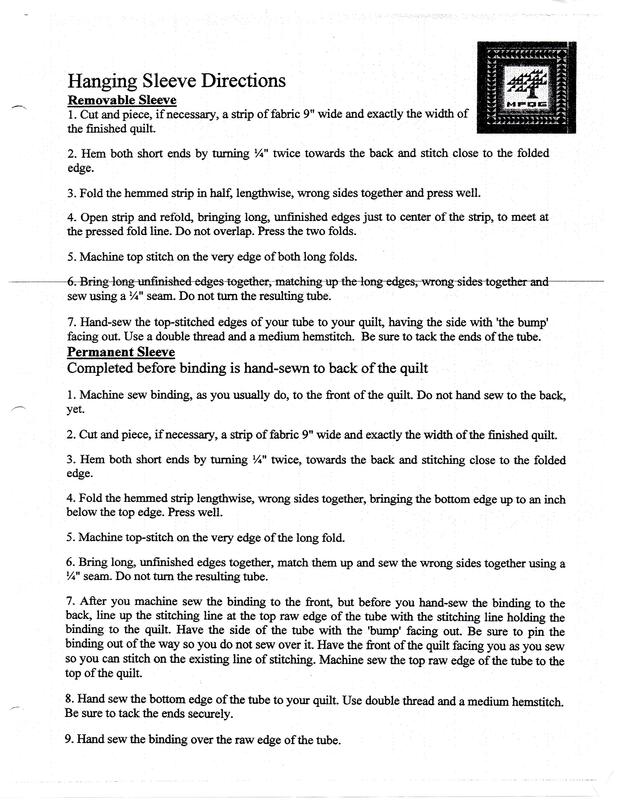 Now, I will have to re-ignite my rusty sewing skills and try to produce an actual quilt! A project for 2017. Please know how much we appreciate all the hard work and time that is put into the blankets. They are so beautiful! We are forever grateful for your ongoing donations. Please give June Cornell a special thank you for all her work in organizing such a wonderful event. Did you know that you must have written permission from the copyright holder in order to sell a quilt made from a copyrighted pattern? Most quilt patterns, whether published individually, in a book or magazine, or in electronic format are protected by copyright. Only the copyright holder may profit from that pattern, or its derivative works, in any way. Check the copyright notice on the pattern; some explicitly grant permission for the sale of a quilt. If not, write and ask for permission. Many quilt designers will gladly grant permission, as one of our members found out last year. 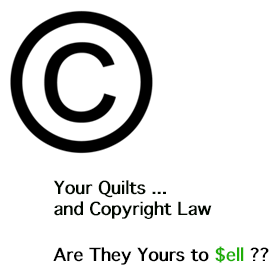 When in doubt, either contact the copyright owner for written permission, or do not offer the quilt for sale. Note: This article was taken from the Pantone website (which is why it's a bit "over-the-top".) 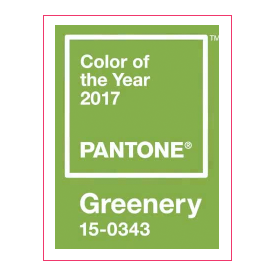 For more information, go to Pantone . A refreshing and revitalizing shade, Greenery is symbolic of new beginnings. It's a fresh and zesty yellow-green shade that evokes the first days of spring when nature’s greens revive, restore and renew. Illustrative of flourishing foliage and the lushness of the great outdoors, the fortifying attributes of Greenery signals consumers to take a deep breath, oxygenate and reinvigorate. Greenery is nature’s neutral. The more submerged people are in modern life, the greater their innate craving to immerse themselves in the physical beauty and inherent unity of the natural world. This shift is reflected by the proliferation of all things expressive of Greenery in daily lives through urban planning, architecture, lifestyle and design choices globally. A constant on the periphery, Greenery is now being pulled to the forefront - it is an omnipresent hue around the world. A life-affirming shade, Greenery is also emblematic of the pursuit of personal passions and vitality. Many more color pairings are shown at Pantone.